The territory around Uzzano, in the Valdinievole, is a collection of interesting hamlets that harmoniously dot the plains and hills. This landscape has a charm that’s resisted the effects of time, so much so that even Giacomo Puccini spent a few months here, during which he was inspired enough to compose the second and third acts of La bohème. He stayed at Villa Orsi Bertolini, a calming place surrounded by olive groves and cypress trees, where the maestro would relax in a stone basin in the garden. Today, the residence is known as Villa Anzilotti and is open on special occasions for visitors to explore. There are many traces of the area’s history around here, especially at the castle. Even the religious buildings have their own stories to tell, like the 13th-century Church of Santi Jacopo e Martino, the patron saints of the community. Inside, visitors will enjoy the Romanesque holy water font and a 16th-century statue attributed to Giovanni della Robbia, as well as a wooden crucifix made in the 1600s that can be seen on the high altar. Uzzano is also home to two 17th-century oratories dedicated to Madonna del Canale and St. Anthony of Padua. This area was included in a stretch of the via Cassia-Clodia, the historic road that led to Lucca. It’s very likely that thanks to the wayfarers traveling the route, who in the Middle Ages were joined in droves by pilgrims walking the via Francigena, hospices were established in the area. 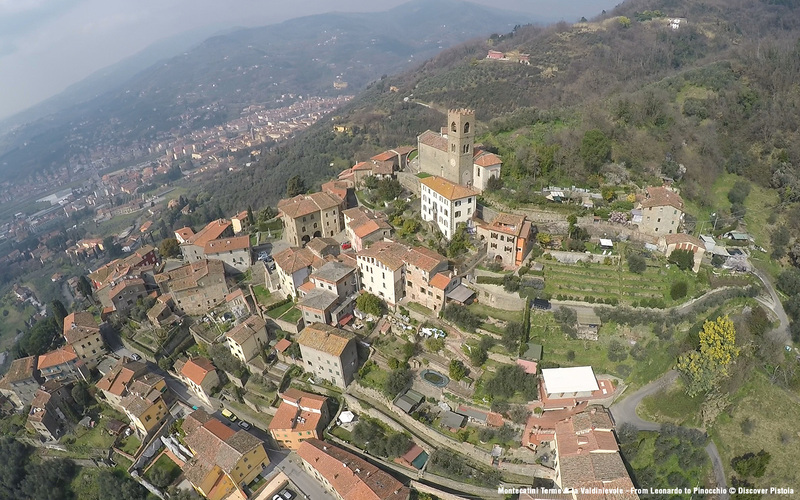 Uzzano still preserves its castle, the historic centre clinging to the hillside. This splendid position offers expansive views of the entire valley, but also looking up from down below, the village can’t be ignored thanks to a special lighting installation that makes it visible from every corner of the Valdinievole. For those who love good views, it’s worth visiting the Pianacci hill, a sort of natural terrace 500 metres above sea level with views that stretch all the way to Florence and even the sea.